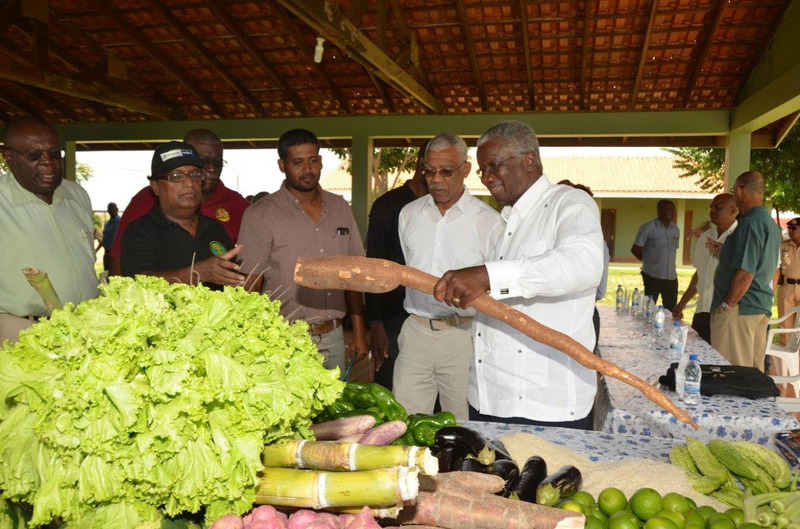 This declaration was made during a visit to the 29,000 acres agricultural venture by Granger and Barbadian Prime Minister, Freundel Stuart, yesterday. This venture located in the North Rupununi, Upper Takutu-Upper Essequibo (Region Nine) represents a major investment by prominent Barbadian investor, Sir Kyffin Simpson in Guyana’s agriculture sector. According to a release from the Ministry of the Presidency, Prime Minister Stuart said that the success of the Santa Fe farm can serve as a model for other investors from other parts of the Caribbean and further afield to get on board as Guyana is definitely open for business and investments. 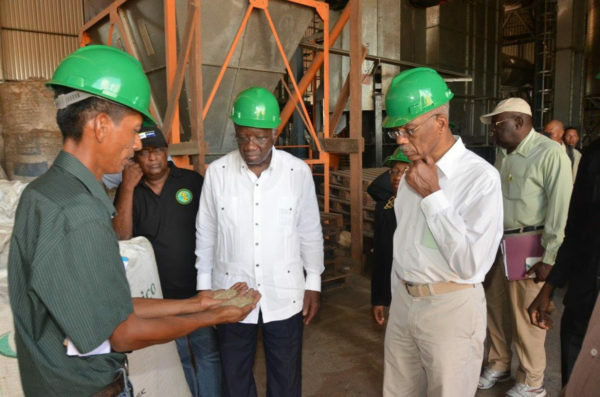 “We have come to see for ourselves because we have a message to take back to Barbados…the project at Santa Fe is as good an example as any to be found of the wisdom of venturing out of Barbados and other parts of the Caribbean and coming here into Guyana and invest. 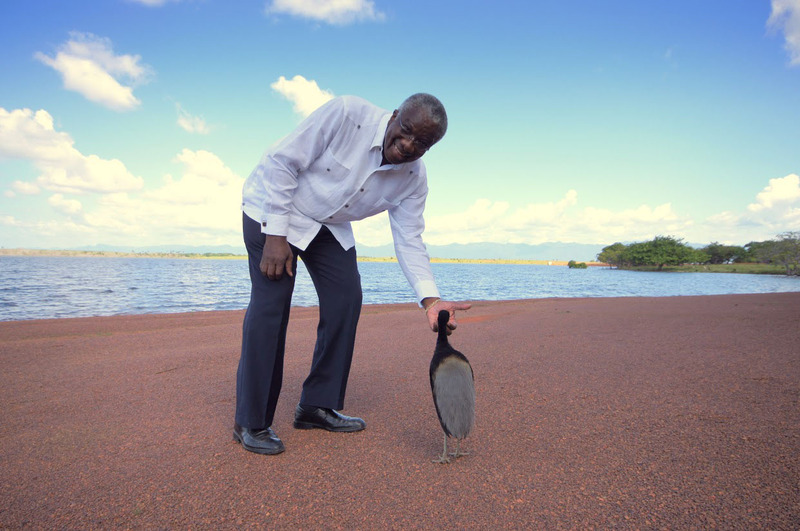 If the Brazilians can do it, if the Chinese can do it…we here in CARICOM can do it as well,” he is quoted as saying. 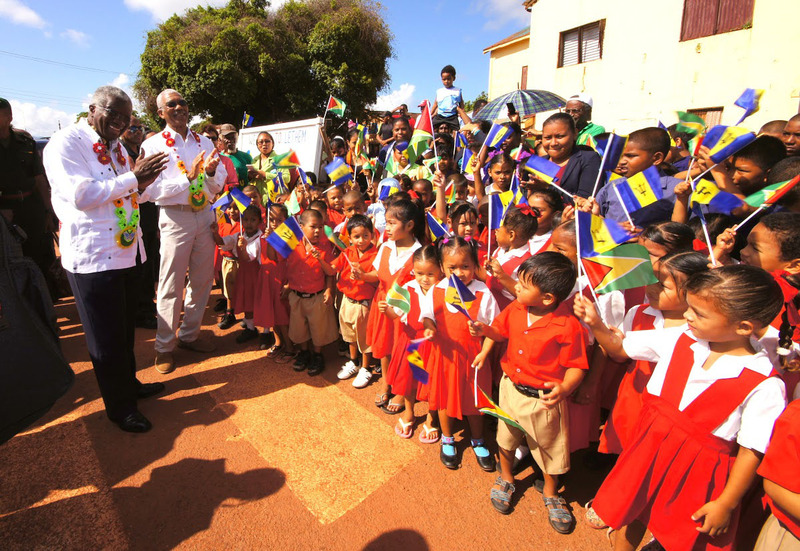 The release notes that President Granger said that Guyana can benefit from the expertise of Barbados, which is known for its world-class tourism product. 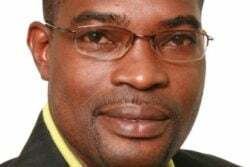 “I want to see entrepreneurs from Barbados combining their product with our product and we are going to be participants of this Caribbean project of developing our countries for our people and our children…the door is open and we are here to show our Caribbean brothers that with our land space, once we have investments and the expertise, we can become as prosperous as any other part of the world,” he said. 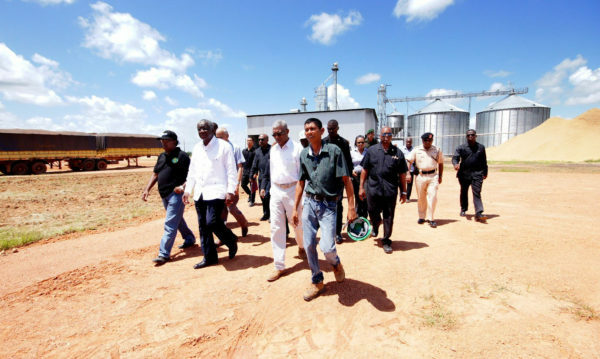 The release further noted that Government remains committed to the development of Rupununi and the Santa Fe Farm represents a model of what is possible with further foreign and local direct investment in the sector, even as opportunities are explored to support small and medium scale farmers. Though the farm spans a total of 29,000 acres of arable lands, Farm Manager, Persaram Ramdat explained that currently 1200 acres of land is under rice cultivation, while another 8,000 acres is being prepared for rice. Rice grown at Santa Fe is exported, while ground provision and other cash crops are sold in Lethem. The rice lands are supplied with water directly from the Ireng River through a gravity irrigation system. This system and the amount of pesticides and fertilizers being used on the Farm were subjects of concern in 2014. Then Member of Parliament now Minister of Indigenous Affair Sydney Allicock had told Stabroek News communities in the Rupununi were concerned by reports that three times the amount of fertilizers and pesticides than on the coast were being used on the farm which borders the wetlands of the north Rupununi. Allicock had said that answers had been sought from the company as to what sort of pesticides and fertilizers were being used but the information had not been provided. He had pointed out that while the runoff from the farm drains into the Ireng River, during the rainy season, particularly when the rains are especially heavy, it is a different story. “When it overflows, the whole area is flooded meaning if there is any sort of pesticide used, it could trickle down posing a threat to the eco-system,” Allicock had said, adding that the budding eco-tourism sector of the area would also be affected. 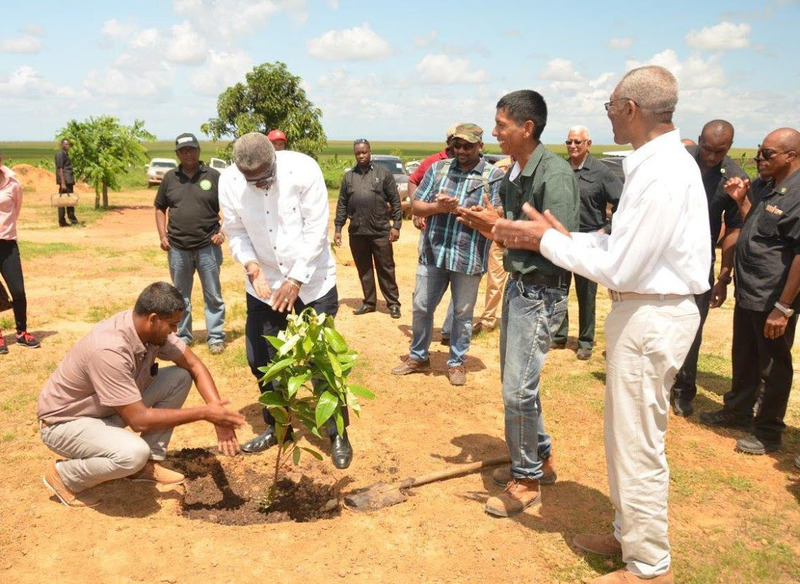 He also pointed out that the runoff would flow into the tributaries of the Rupununi River which flow into the Essequibo River. During yesterday’s visit the President and Prime Minister were accompanied by Minister of Agriculture, Noel Holder, Minister of Communities, Ronald Bulkan, Minister in the Office of the Prime Minister, Senator Darcy Boyce who is responsible for energy, immigration, telecommunications and investment in Barbados, Executive Director of the Caribbean Agricultural Research and Development Institute (CARDI), Barton Clarke, Chief Executive Officer of the Guyana Livestock Development Authority, Nigel Cumberbatch and Chief Executive Officer of the National Agricultural Research and Extension Institute (NAREI), Dr. Oudho Homenauth.